Walsall Council has been forced to do an embarrassing U turn over controversial plans to part privatise the town’s historic outdoor market. Members of Walsall Council’s cabinet confirmed last night (Wednesday, June 23) that its joint venture market management model with Norton & Proffitt is no longer on the table. 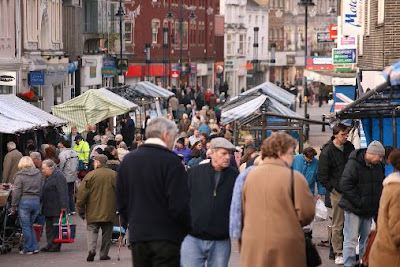 The significant move follows a long running campaign by market traders and UKIP MEP Mike Nattrass who were completely opposed to the partial sell-off of Walsall’s outdoor market. In May, Mr Nattrass joined market traders to stage a protest against Walsall Council’s bid to part privatise the market. Now Walsall Council has halted the move and will now undertake a borough-wide markets review to look at ‘all options’ for their development and management. Members of the cabinet also approved plans to instruct the submission of a planning application to facilitate the temporary move of Walsall Market to a prime site on The Bridge. Mr Nattrass said: “I very much welcome the council’s decision – members of the council have at long last seen sense and listened to the market traders. “It is our campaign that has forced Walsall Council to go back to the drawing board. “The market is an important part of Walsall’s rich heritage. It is a tradition which stretches back to 1220 and it should be run by the people of the borough. “The council should never have tried to push this part privatisation of the market forward. The whole sorry saga has been deeply distressing for the market traders who are a credit to the town. Karen Sands, from Walsall Market Traders Association, said: “I would like to thank Mike Nattrass for his support during what has been a very difficult time for the market traders. “The move to The Bridge will be fantastic and will boost trade in the area. We did not want the sell-off and hopefully, following the markets review, it will never be considered again.